The mission of Bit of Hope Ranch is to Reach, Rescue and Restore hurting children, families and horses through offering nature based and complete equine therapy wellness and educational programs. This non-profit, 501(c)3 organization was founded in 2007 out of Meg Vanderbilt’s passion to help hurting children by allowing them to find hope and healing through a relationship with a horse. All of the horses and animals have a story when they arrive at the Ranch. Children can often identify with these physical or emotional scars that the horses present. Clients work together with the therapy team which includes a licensed professional, an equine specialist and of course…a horse! Clients find this type of therapy powerful and effective. Beginning August 2016, the Ranch now offers Therapeutic Riding services for special needs clients. The Ranch is founded on Biblical principles and the love of Jesus Christ. The Ranch began from humble beginnings. In 2007, Meg only had a dream and a passion for helping horses and children. There was no property, funding or a horse. The Ranch’s first miracle was when God prompted an investor— a perfect stranger, to purchase the property for Bit of Hope. It had a ton of potential, but need a lot of TLC. The first 16 months were spent getting the property safe for horses and humans. Thanks to our community’s sweat and donations, we were able to open our doors in 2009! Roof collapse in the Large Covered Arena during a snow because arenas were not constructed to code before we moved in. 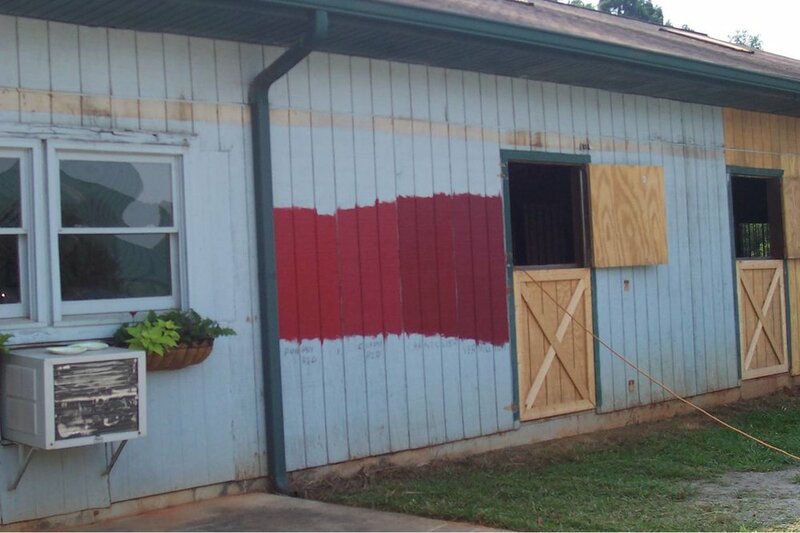 Stalls had to be repaired inside and out. Small Covered Arena getting new footers and bracing. No…the camera is straight. This arena was built poorly when we moved in. Our Wellness Clinic —was a stallion barn before we moved in.